Rule #395: Pregnancy brain is absolutely an acceptable excuse for every mistake women make in the third trimester. And even a little bit after. I’m so sorry I’ve been a bad little blogger lately, y’all. My brain is functioning at a record-low capacity these days. I would blame it all on Baby G #2, but I think the toddler running around is also at fault. I have no idea how I’m going to handle it when there are TWO moving creatures romping through the house! It’s been a busy little life lately, but we’ve been so blessed and honored with some major shows of love. My absolutely gorgeous mother-in-law and sisters-in-law threw a shower for sweet Baby G #2 last weekend. They chose the theme “Love You to the Moon and Back” to go along with one of the board books we’ve picked out for Baby G #2. It was beautiful and so full of love + joy! I LOVED all of the decor, food, and flowers! Everything was perfect. Three of my closest friends came in for the weekend to celebrate with us! Along with my gal pals came two of their kiddos. We had 3 boys under the age of 3 in the house, and it was AWESOME! They all played around and with each other and kept us on our toes. I think my one friend who’s not a mom yet got a good dose of the… let’s just say activity level… of little boys. They definitely kept us busy, but I can’t tell you the joy it brought me to see my friends’ kids playing with Corey. There’s something majorly full circle about that. Moving on from baby shower goodness to a completely opposite spectrum topic: my latest Netflix binge! 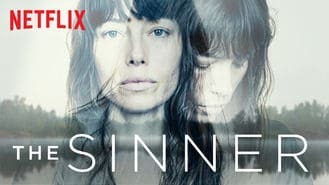 I started watching The Sinner one night after Corey went to bed. I stayed up wayyyy past my little ole bed time and then finished it the next day during nap time. It. Is. SO. Good. It’s a thriller that will keep you on your toes and guessing until the last episode. Jessica Biel stars and produces the show, and she’s pretty compelling in both roles. It’s worth every ounce of sleep I didn’t get. Let’s be real… I’m not getting much right now anyways! I had to share my latest lunch obsession (arguably can be labeled a ‘binge’, too). I’ve been LOVING the cobb salad at Zaxby’s lately. I pair it with Tessemae’s Organic Creamy Ranch because it’s delicious and on the healthy train (Whole 30, dairy-free, sugar-free, and gluten-free). It’s a huge salad that will ACTUALLY KEEP YOU FULL until dinner. This is a ginormous pregnant woman saying that, too. During our trip to Michigan last summer, my mom’s aunt had the best array of bird feeders I’ve ever seen. There were tons of them. All kinds of shapes, sizes, types of feed, etc. My favorite one by far was the the one just like this one below . I thought it was gorgeous how the birds could come and feed and you could just spy on them from the other side of the window. She had so many birds come to feed out of this one, so I’m hoping we get just as lucky. I’d like to have some bird buddies to give quirky names to. Fall is coming early to our casa, folks! With Baby G #2 coming at the end of August/early September, I want to have the whole house decked out for my fave season before he/she arrives. I went ahead and ordered our first round of Bath and Body Works candles while they were on sale AND 20% off! We’re pretty obsessed and take our fall candle scents very seriously, y’all. I plan on burning one of these bad boys, cranking the thermostat to 65, and pretending like fall is in the air. Another shower of love came this weekend: my aunt (known to Corey as GiGi) flew in from New Mexico to spend a little time with us! We had so much fun showing her around our stomping grounds, playing lots of baseball, and getting in tons of snuggles and laughs. I took her for a little girls’ lunch to one of my faves: Fielding’s Local Kitchen + Bar. I know I’ve posted about this place before, but I can’t tell y’all how much I love it. Their salads are fresh and different (and oh-so-yummy). And their more indulgent dishes (I like to call this my dessert) are worth every bloody calorie. I mean… who can pass up truffle and parmesan french fries?! All the girls and Mr. Corey. Can you tell he was loving the attention? Also… can you spy Jon Boy’s finger? I love these people. A GiGi, her Corey, and his Noni. I decided to actually shower + wear makeup since we had a special guest in town. Two of my staples these days are these leggings and these sandals. I had a MAJOR score at the Nordstrom Anniversary Sale this year. I’ve been drooling over the Beachwaver Pro curling iron for about 2 years now, and I finally pulled the trigger. I’m still learning how this gorgeous little gadget works, but this hair style took me about 8 minutes and almost 0 effort. You choose which side you’re curling on, clamp an end piece of hair, and hit “GO”. 10 seconds later, you’ve got a gorgeous, loose wave. You can even change the kinds of curls you get based on the angle of the iron. I’m in love! While the girls went out for a morning of shopping and lunch, the boys went to Academy. Corey was pretty pumped to check out all the baseball goodies. We did NOT end up with a helmet or a glove though, my friends. I’m not quite ready for that level of commitment. To wrap up all of the fun, we took Corey and his Noni to an Astros’ game! This face pretty much sums up how the big man felt about it. French fries, his own ‘big boy’ water bottle, and all of his favorite things (anything Astros) made for one happy camper. I have to end this post with an apology about my lack of content regarding the Nordstrom Anniversary Sale! I had planned on doing so, so many posts, but to be honest, this year was not the greatest year for the sale. Some of my items arrived broken and most of the items took at least 10 days to get to the house. Normally Nordstrom is much better, so I was pretty disappointed. I did order these Le Creuset bakers that were on the sale, and I’m loving them already! Le Creuset is hands down the best line of cooking/bakeware out there, so this sale made me a very happy little cook. I ordered the white, but it looks like they’ve only got the red and blue left.